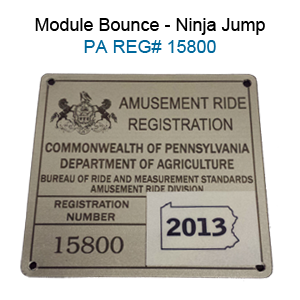 The Module Moon Bounce is licensed and registered in Pennsylvania. Please click here for pricing and availability. Got Bounce? The Module Moon Bounce provides over 300 square feet of pure bounce, perfect for all size gatherings of friends! Classic styling, economical pricing and interchangeable art panels make the Module House a must-have revenue generator for every family entertainment, rental and amusement business. Inflatable jumps are one of the most popular amusement choices because they are loved by children, healthy, simple and cost-effective. Bouncing puts you in a state of health and fitness, improves your sense of balance, provides an aerobic effect for your heart, strengthens your muscles, increases the capacity for respiration, results in a better mental performance and comes in all your favorite shapes and themes! Made with high-visibility, fire resistant mesh around all sides and our own lite n’ strong™ vinyl, the Module Moon Bounce are made with the only lightweight vinyl that is fire retardant yet strong, having the highest tear and tensile strength of any vinyl on the market.